2016 was a big year for Metro transit – from infusing new life into a historic icon to expanding service in one of the region’s busiest transit markets. Here’s a look at some of the key projects and enhancements Metro wrapped up, kicked off or moved forward with over the past 12 months. The first major project of the year transformed public transit service in North St. Louis County. The North County Transit Center in Ferguson officially opened its doors on March 14, offering MetroBus riders a climate-controlled waiting area, public restrooms, digital arrival time boards, 24/7 security and other amenities. 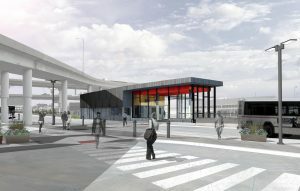 The new transit center allows Metro to provide faster, more frequent and more direct service through a complete redesign of MetroBus service for North St. Louis County, one of the region’s fastest growing transit markets, accounting for almost 20 percent of all MetroLink and MetroBus boardings. Metro is always keeping a pulse on the latest advancements in transportation technology. Last year, Metro tested its first electric articulated bus on the #70 Grand route, one of several tests of different models and sizes of electric buses conducted in order to evaluate this cutting-edge technology. In addition to being environmentally-friendly, electric buses have the potential to significantly reduce costs for fuel, parts and labor. Toward the end of the year, Metro transit unveiled a new website. The new website brought the focus back to Metro riders with a new design and streamlined navigation, making it easier to plan a trip, view the latest MetroBus or MetroLink schedules and learn about Rider Alerts. Construction work got underway in 2016 on the expansion and enhancement of the Civic Center Transit Center in downtown St. Louis. 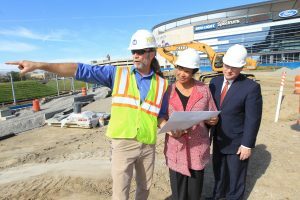 This project will expand the Civic Center Transit Center and triple the number of existing bus bays, which will allow MetroBus riders to connect with all of their bus routes inside the transit center and away from traffic on 14th Street. A building is being constructed on the site that will feature new passenger amenities, including public restrooms, an indoor waiting area, digital boards with MetroBus arrival times, and a Metro Public Safety substation. The new transit center will open this fall. 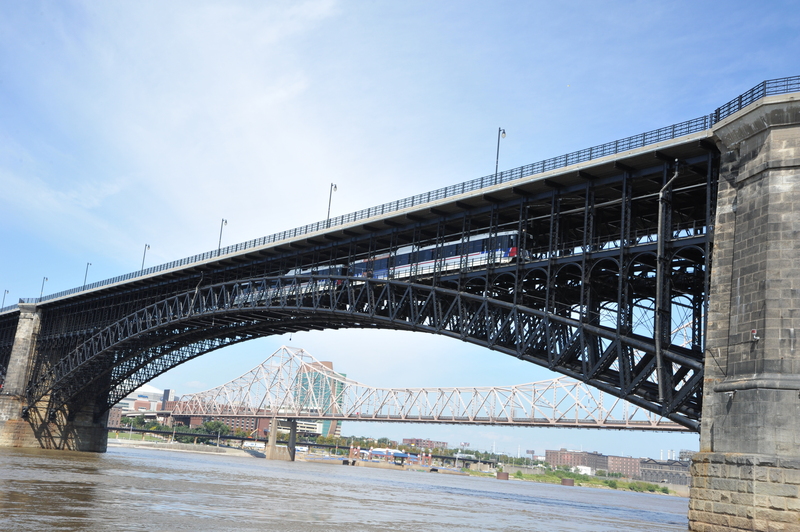 Metro rehabilitated a unique, historic landmark with the completion of the Eads Bridge Rehabilitation project. This was the first comprehensive, full-scale rehabilitation of the 142-year-old Eads Bridge, and it will extend the life of the bridge for another 75 years. The project team restored and repaired the bridge’s steel truss and superstructure, and applied a special anti-corrosion coating to protect it into the future. In addition, the structural flooring system for MetroLink was completely replaced with new rails and ties, and the power system was upgraded to new overhead conductor rail, which helps improve the light rail system’s efficiency and reliability. Metro co-owns the bridge with the city of St. Louis. Design work got underway on the new MetroLink station near Boyle Avenue in the Cortex Innovation Community. The project includes the construction of a new MetroLink station, an addition to the Great Rivers Greenway bike path, and an extension of the platform at the Central West End MetroLink Station. Groundbreaking for the new station, which will be located between Boyle and Sarah Streets, will take place later this year. Metro transit continues to be recognized as the best of the best, and top federal officials put Metro in the national spotlight last year. The transit operation was specifically highlighted by the Federal Transit Administration (FTA) in the July 26 Federal Register as a case study in transit asset management, for setting the standard with its industry-leading maintenance program. The St. Louis region was visited by the FTA’s top leader, Acting Administrator Carolyn Flowers, last fall. Flowers said she was impressed by what she saw Metro transit doing with federal support. That sentiment was echoed by Julián Castro, Secretary of the U.S. Department of Housing and Urban Development, who visited the North County Transit Center in December and praised Metro and Bi-State Development for the achievements and the investments made to support the St. Louis region. More than $1.5 million in grants were awarded in 2016 that will establish mobile health units and fresh food kiosks to several MetroLink stations in North St. Louis County this year. The Bi-State Development Research Institute secured nearly a million dollars in federal funding for an innovative mobile health program, which in partnership with the St. Louis County Department of Public Health, will bring mobile health units to the Wellston MetroLink Station, the Rock Road MetroLink Station and the North Hanley MetroLink Station in North St. Louis County. The Research Institute was also awarded a $583,958 grant from the Missouri Foundation for Health to launch an 18-month pilot program to bring healthier food options closer to Metro riders and residents in the communities adjacent to the North Hanley and the Wellston MetroLink Stations. It was an exciting 2016, and more is on the horizon this year with the completion of the Civic Center Transit Expansion project, continued work on the new MetroLink Station near Boyle Avenue, and other projects and initiatives. Stay tuned to NextStop and get the inside track on all of the exciting news coming out of Metro transit in 2017.